Who knows of a 12 year old girl that would love to have a disco themed party? 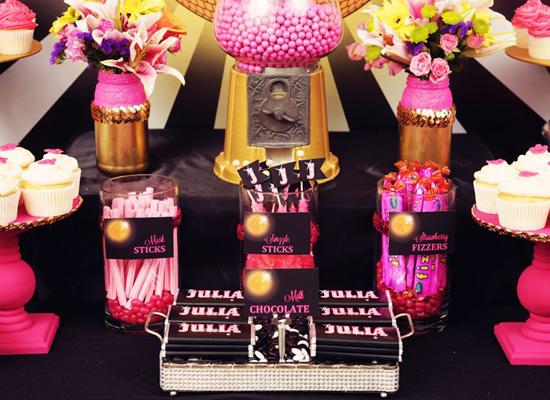 Well congratulations to Julia on her 12th party with a sensational Disco Party table from Justine. It’s always enjoyable to see how Justine from Sensationally Sweet Events pulls together her Candy Buffet Party Tables. From my end it all starts with some creative ideas from Justine about what she’d like to achieve from her designs and as soon as I get those initial ideas, we get started on the graphic design, in this case, for a disco party. One of Justine’s specialties is her backdrops, which really frame the party tables that she designs. 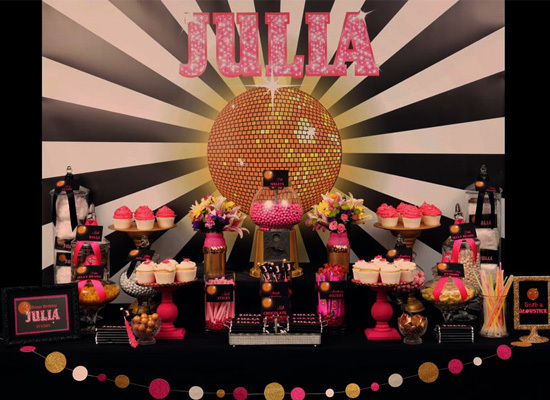 Julia’s 12th theme was disco party, so we got to working on the graphic design for the backdrop with the main focus of a large disco ball wishing Julia a happy birthday!! The wording ‘Julia’ was encrusted with diamonte designed sparkles and the disco ball was intricately drawn to give the impression of a glowing disco ball. Feel free to check out other photos of the Disco Party Styled Table taken by Lexi at Mr & Mrs Smith Photography which really showcase the amazing table styling by Justine and the party supplies by Concept Designs. Contact us if you have any questions relating to this post or if you would like the graphic design ideas from Concept Designs. Even though Concept Designs is based on the Gold Coast, Australia, we can deliver Australia wide and can even send your graphic design files internationally.